When Fligh lieutenant J H Boothman flew over the lee on Solent course in 1931 at an average of more than 340 mph in the Supermarine S6B, that was that; the Schneider Trophy belonged to Britain for good and always. Nobody could take it away, but there was very srong posibililyof the air speed record (which was another way then of describing the world speed record) being taken away cruel fate and some painful, even fatal, accidents had prevented the Italians from competing in this last round of the Schneider series; they would be out for revenge in the only way possible and all the evidence suggested that they were quite capable of taking it. Italy had been in the running since 1927, when Major Mario de Bernardi took the record at 297.83 mph in a Macchi M52 raising it in a M52bis to 318.64 mph in the spring of the following year. America had been out the running, as had France since 1924 although the record had been excusively French from the beginning until 1922 with the exception of a single day in August 1909 when it had belonged to Glenn Curtiss of the USA. Now, with Mussolini encouraging a foreign policy which was based in a large measure on reducing the influence of France and on emphasising the surperiority of Italy, the air around Lake Garda was filled with the scream of V-24 Fiat engines. hauling the seaplanes of the Italian High-Speed Squadron at speeds which promised to be unmatchable. Alas that same air was also loud with lamentations for the pilots who who to often perished in their proving flights. The record still stood to Britain as it had since 1929, and a few minutes after Boothman had conclusively won the Schneider Trophy Flight Lieutenant GA Stainforth had the other S6B in the air, and pushed the reccrd over the magic mark of ten kilometres a minute for the first time. Imperial measures made 388 mphs sournd less epoch marking E.W. (later Lord) Hives, then manager of the experimental department at Rolls-Royce, was not satisfied; he wanted and expected 400 mph. The Air Ministry, on the other hand,wanted the RAF High Speed flight to clear out of Calshot and let the flying boats come back home; and only afler intercession by Sir Henry Royce himself was the feted team of racing pilots suffered to remain for another fortnight and another crack at the record.What followed was a triumph of fuel chemistry over mechanical engineering, for if there were anything more that RolI-Royce could do to that frenzied piece of brinkmanship known as the R engine to make it more powerful, they had no time in which to do it. Hives summoned instead the man who had put the R on the way to success in 1929 and the R was given a new Rodney Banks cocktail, R-Ralso raised the blower ratio, and at 3400 rpm the engine gave no less than 2783 bhp for an hour on the test bench. lt did not like it, things started to stretch and distort, some cylinder holding downbolts broke and so the supercharger drive ratio was put back to what it had been. The fuel alone gave the engine another 250 bhp. The final mix chosen for the sprint engine was 60% melhonol, 30% benzole, and 10% acetone, with added lead. The fuel pump had to be uprated, the lower calorific content of alcohol, compared with petrol, meant a much higher rate of fuel consumption (it rose from 0.6 to 0.85 Ib/mph) involving a rate of flow higher than the orginal pump could manage. This thirst for fuel created operational problems too, quite apart from the fact that the Banks mix tended to dissolve many of the seals and sealing compounds in the aircrofts fuel system it was likely to be consumed before the six runs up and down the measured course weer completed, so limited was the tankage available. Furlhermore, the very rich mixture tended to wet the spark plugs at anything less than full power. Soon an elaborate starting drill was perfected. The engine was warmed up at a fairly large throttle opening when the aircraft was on its launching lighter, alter it had been towed to the take-off point. When the engine was properly hot, it was shut down, and covering. were promtply put over th radiotor surfaces (wings and floats) and over the tail fin which constituted the oil tank. The induction system was drained, the fuel system topped up, and when everything was ready the pilot - once again Flight Lieutenant George Stainforth, one of the most polished in the annals of the Service - was ensconced. The covers were removed, the engine was started, Stainforth promptly rammed the throttle forward and the aircraft shot off the lighter for take-off. His fastest run down the course was at 415.2mph; the mean figure for the record was 407.02 - sufficiently better than the 399.99 that Hives had warned would not do at all. 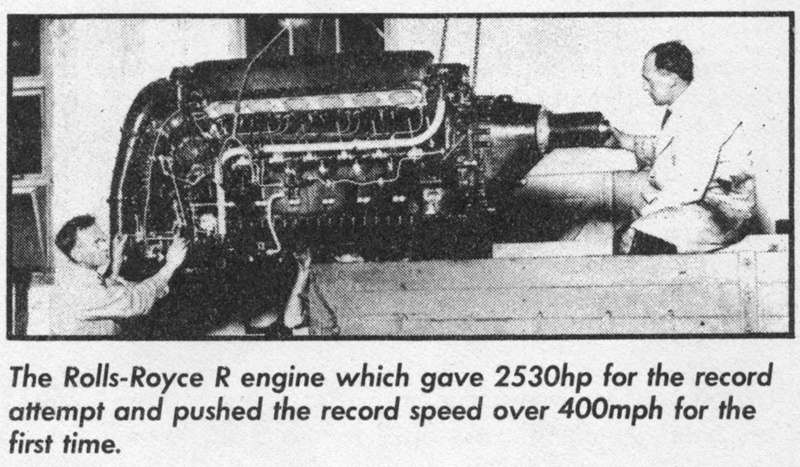 As used for the record attempt, the Rolls-Royce R gave 2530 hp, and was coupled to a special new airscrew that had been made expressly to absorb the extra power. The engine that was to take this record from it developed the same power in the air as the R had on the ground in that bolt-stretching bench test, and it relied on no fancy fuels; but it had two airscrews. This was the fabulous Fiat AS6, powering the Macchi Castoldi MC72 which had ben meant to give battle to the British in the 1931 Schneider Trophy race. Accidents kept it out of the fight, alas, accidents that were frightening and fatal, costing the lives of several excellent pilots and defying explanation as mysteriously as the crash that took Kincaid's life when he had made a run for the record in the 56 at Solent. Italy's Fascist dictator Benito Mussolini directed a change of attitude in the High Speed Squadron and its supporting technicians. Inconsistency was not, in his eyes, a fault: he employed it as a professional technique and elevated it to a political art form. He had ordered the Italian racing team to win the Schneider Trophy 'at all costs'; now, he ordered that no more lives were to be lost, but that the record should be gained. Dictating policy was as far as he went; working out its execution was left to the commander of the High Speed Squadron, Colonel (later General) Bernasconi, and the distinguished aeronautical engineer General Crocco. But the man who solved the riddle for Fiat and Macchi, just as he had for Rolls- Royce and Supermarine, was once again the man from the Ethyl Export Corporation, the man who was later to be director general of our aero-engine production during the World War, and who was eventually to retire as Air Commodore F R (Rod) Banks, CB, OBE, et seq. In his fascinating autobiography I Kept No Diary (Airlife, 1978), Banks recalls that he was sent for by General Crocco in 1932 to help in the development of the Fiat AS6. It had aiready given 2850 hp for a minute on the bench, and in a matter of weeks it was able to give that for an hour, followed by a test cycle representing six runs up and down the 3km course at Lake Garda. In between, the Italians had been able to furnish a clue to their previous disasters. Evidence had shown that the induction system had exploded when the aircraft was working up (or rather down, in a shallow dive) to its maximum speed; and when Banks saw the Fiat test house, he saw how the accidents had been caused. Fiat, like Rolls-Royce, had been attracted by the age-old idea of a forward-facing 'ramming' air intake, which would make use of the forward speed of the aircraft to obtain a kind of free supercharge, in which the kinetic energy of the air (moving relative to the aircraft) was converted to pressure energy in the intake. Rejected in the early days, the idea was valid now that speeds were so much higher, for the effect increases as the square of the speed of the vehicle through the air. A ramming intake was part of the engine installation in the MC72 - but it was not simulated on the factory test bed. Testing there proceeded normally, and the carburation was adjusted to everyone's satisfaction; but when the MC72 was approaching full speed, the reduced pressure differential across the carburettor weakened the mixture. A few seconds of this increasing impoverishment at full throttle resulted in a shattering backfire in the inlet manifold - and that manifold was about eight feet long! A brainchild of the brilliant Tranquillo Zerbi, a designer who had already given Fiat the finest and fastest 11/2 litre job in the whole history of Grand Prix motor racing, the AS6 was an uncommonly long engine. It was in fact two V12's arranged in line ahead on a common light-alloy crankcase. The two crankshafts were not coupled, but each drove (through gears) a propellor shaft, these two shafts being concentric and rotating in opposite senses to drive contra- rotating propellors; the outer shaft, driven by the front engine, drove the rear airscrew, and the inner shaft driven by the rear engine drove the front airscrew. The engineer Castoldi had been interested in the contra prop concept for several years, recognising the advantage of presenting greater effective area (or I density') while minimising diameter and thus enabling them to be run at high speeds without approaching the threshold of sonic tip speed, which was a barrier to airscrew development until well into the 1940s. He ran extensive wind tunnel tests on single and tandem airscrews and proved his supposition that the efficiency of the rear airscrew was not impaired by the action of the front one. On the contrary, the rear one proved the more efficient, the difference being as great as 15 or even 20%. Here lay the clue to Zerbi's unusual engine arrangement: each half engine drove its own airscrew independently, and the surplus power available from the rear V12 (whose airscrew could absorb less power) was usefully employed in driving the supercharger which fed all 24 cylinders. Other than ground adjustment of the relative pitches of the airscrews' blades, no means were available for synchronising the speeds of the two halves of the engine, but this did not seem to matter; they varied by only 2 or 3%, and this proved to be negligible in practice. The AS6 had more advantages to be listed. The tandem arrangement of the engines minimised frontal area. The apparently inconvenient length of the crankcase could be turned to good purpose by utilising it as a structural member, mounting it rigidly in the airframe where it could contribute to the strength and stiffness of the whole aircraft. From there on, it was straightforward Fiat racing practice; its cylinders were smaller than those of the R, with a shorter stroke, but the 24 of them amounted to a capacity of 51.1 litres. At the top of its 140mm stroke each piston gave a 7: 1 compression ratio, supplemented by the high boost pressure coming from a big supercharger spinning at about six times crankshaft speed. Naturally, in view of its origins, the engine was beautiful; and it weighed only 2050 lb. . In relation to its displacement this was a better figure than the Rolls-Royce one. In relation to 2850hp, it was inferior to the power; weight ratio of the R In every other respect the comparison was in the Fiat's favour, with a much higher ratio of power to frontal area and a much lower specific fuel consumption. Unlike the sprint R, the AS6 functioned on a mixture based on leaded gasoline; with additions of benzole and ethanol, and the specific fuel consumption was a very modest 0.55 Ib/hph, bearing witness to a generally lower level of thermal and mechanical stress than the R suffered. It was enough. At Desenzano, on the southern tip of lake Garda, the 3 km course was flown by Warrant Officer Francesco Agello at 422.888mph, in 1933. The immediate objective having been achieved, with all due deference to II Duce, more development work was undertaken. Nothing was altered in the engine itself, but the ramming air intake was made more efficient, and modifications to the airscrews (including a 6mm reduction in diameter) allowed the engine to gain another 1000rpm. 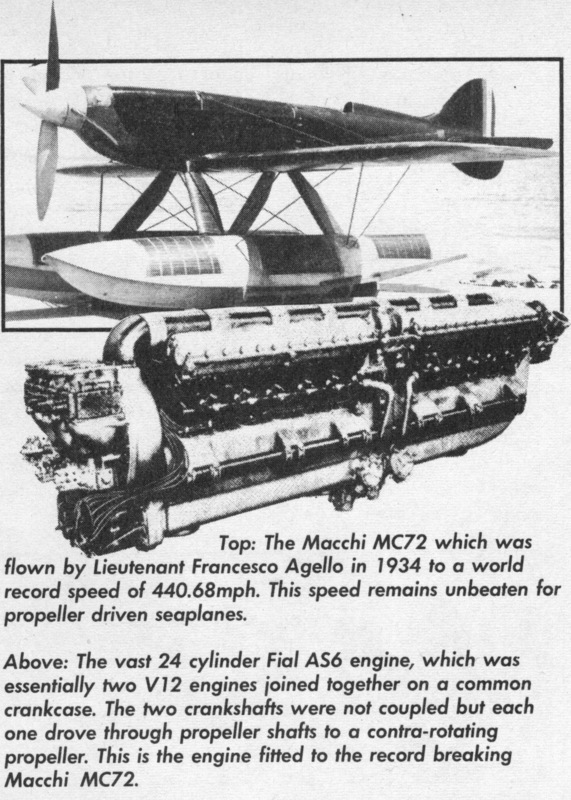 The upshot of all this was a power output of 3100hp, sufficient to propel the same MC72, in the hands of the same Agello (now a Lieutenant), through the familiar record-breaking sequence at an average of 440.68mph, a figure which has never since been bettered by a piston-engined seaplane.